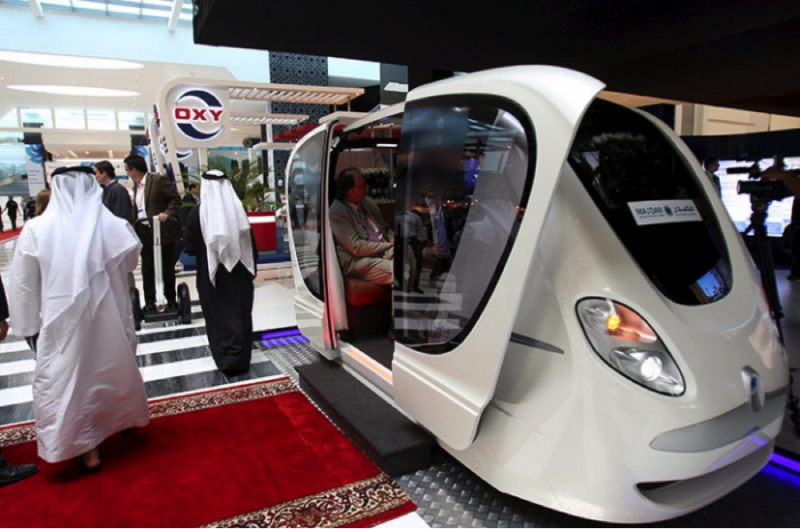 The Personal Rapid Transit (PRT) pods of Masdar City were first exhibited at the World Future Energy Summit in Abu Dhabi in January 2009, giving the visitors a sense of the eco-city’s ambitions. Masdar City is a “futuristic” eco-city designed by the London­-based architecture office Foster + Partners to rely entirely on renewable energies. It was launched in 2006 by the Abu Dhabi government and attracted media attention between 2007 and 2011. The zero-carbon district would cost $22 billion, and house 50,000 people and 1,500 renewable energy and clean technology businesses. The PRT pods, considered the most innovative element of Masdar City (see, for instance, Mohsen and Doherty 2010) were designed by Zagato, an Italian engineering company famous for racing cars, and manufactured in the Netherlands by 2getthere. The Personal Rapid Transit pods were first exhibited at the Word Future Energy Summit. 2009. One blogger positively reviewed the exhibit at the World Future Energy Summit in Abu Dhabi, writing, “The comfort and safety of the pods shows us a rather favorable vision of the future. Ride on cushioned seats, holding hands or facing each other. Have a conversation, catch up on the morning news. The car will stop to let you off at your chosen destination. Chauffeurs for everyone, and Green at that? That’s our future? Not bad. Not bad at all!” (Alternate Energy 2009). The PRT pods confirmed that the future would be one of technological complexity, just as many people imagined when they watched science fiction movies. The logics of autonomy and individualization, long associated with cars, would characterize the future of transport technologies. All in all, the exhibit showed that the imaginaries of the future would remain untouched by problems of energy scarcity, and enabled a comforting and enjoyable narrative in the face of environmental conditions that are deeply unsettling. 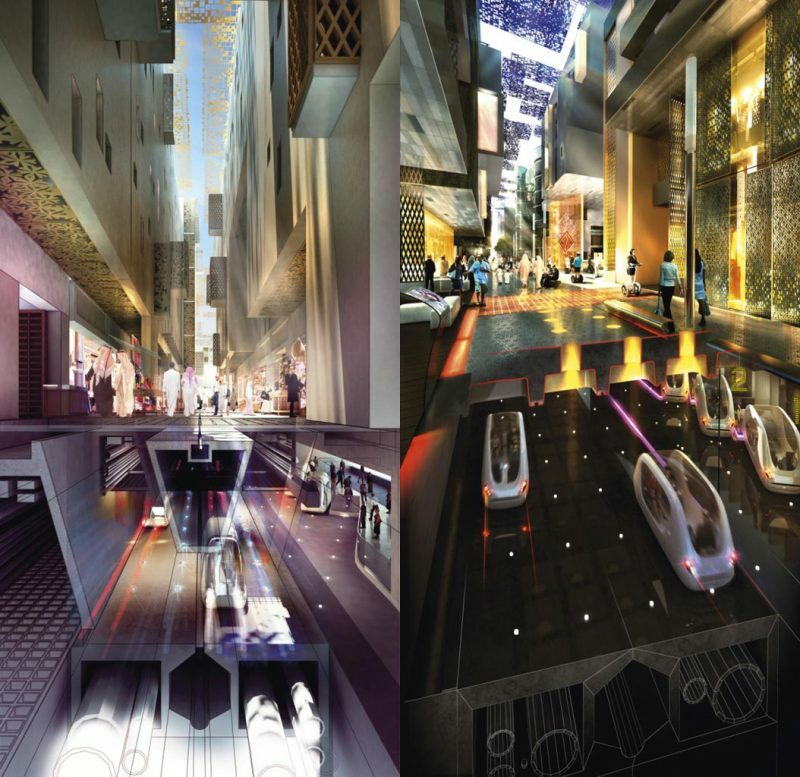 Computer renderings of the Masdar City undercroft were circulated in the media between 2007 and 2010. 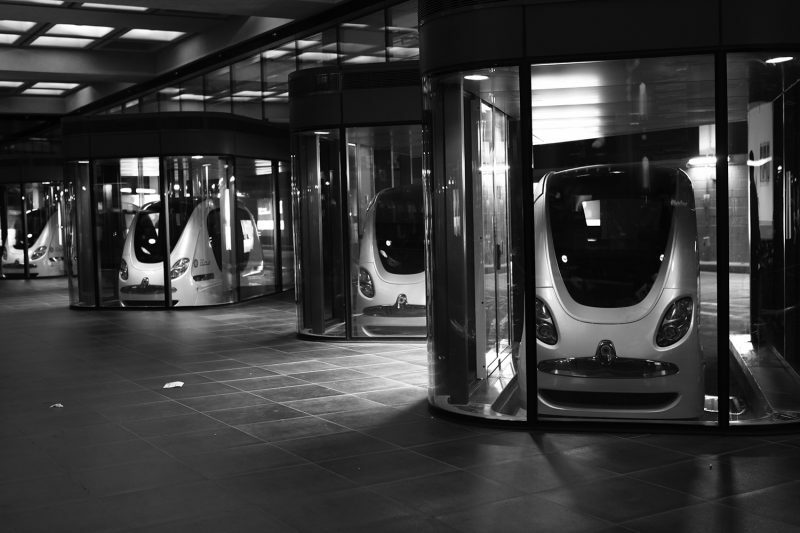 According to the initial plans, the PRT pods would offer personal, on-demand, nonstop transportation between any two points on a network inside Abu Dhabi’s Masdar City, arguably combining the advantages of cars (private travel at any time) and public transport (no congestion and parking issues). Connecting the entire eco-city through a 23-mile network, the PRT would accommodate 1,800 vehicles at 87 stations while also allowing for the widespread distribution of goods. As the Foster + Partners renderings indicated, this transportation network would be located at the basement level of the eco-city, commonly referred to as the “undercroft,” preventing the pod cars from disrupting the everyday life of the Masdar City streets. This meant the whole city would have to be raised one level, about 20 feet above the ground. Although initially a plausible scenario, the project soon proved financially demanding, leading Masdar executives to drop the plans for the PRT completely and search for alternative emission-free means of transport, such as electric buses or cars. And yet there remained one destination to which passengers at Masdar Institute could travel: the parking lot outside the building. In April 2011, Elif and Salim, both graduate students at Masdar Institute—a research institute that the Massachusetts Institute of Technology established inside Masdar City—gave me a guided tour of the PRT pod cars, joining me in the short trip between Masdar Institute and the parking lot outside. Elif and Salim were part of the first cohort of students to tackle the strange material conditions of Masdar City. They lived in the Masdar Institute building, together with another 100 students, and spent most of their time on campus. The Personal Rapid Transit pods were charged in their docks. 2011. In attending to the functions and problems of the PRT pod car, Salim and Elif found it necessary to break it into parts, while also underlining the interactions between these multiple elements. For instance, they explained that the uneven concrete surface of the road increased friction, triggering problems for the suspension system. According to Salim and Elif, these parts ensured that the pod cars moved, and therefore facilitated a future of technological complexity. At the same time, the pod cars were confined between the two stops, and thus could never reach their intended speed of 25 miles per hour because of the short distance they ultimately covered. The PRT pods also experienced unexpected frictions due to the material condition of the road. If in their movement they allowed the emergence of a future where humans managed to mitigate climate change and energy scarcity through technological means, in their restrictedness they demonstrated the impossibility of this imaginary. Salim and Elif sometimes called the PRT an “expensive toy,” rendering its functionality secondary. This seemed especially apt when the pod cars malfunctioned, trapping passengers in the vehicles for up to 20 minutes. Masdar Institute students would begin to complain, promising they would take the shuttle bus next time. Yet the students confirmed the pod cars were “fun.” The innovative mode of transport gave the city a futuristic feel, even though it did not have the capacity to transport crowds. In other words, Salim and Elif were at times quick to laud the PRT, but they also harbored doubts. They suggested the pod cars served as an appropriate metonym of Masdar City, and that the whole idea of the eco-city was lavish. They stressed that such increasing obsession with technological innovation was not unique to Masdar, but rather defined the eco-city concept around the world. In these discussions, the notion of an “expensive toy” appeared to be a dismissive way of describing the pod cars, as well as the future that they characterized. Yet this depiction also permitted the students to frame the project as an exciting opportunity, and revealed an impulse to experience the world in ways that were not yet fully realized. While such emergent infrastructures seemed to define the project of building a renewable energy and clean technology sector in Abu Dhabi, they remained consistently ambivalent and out of reach. In addition to calling for ways of experiencing the world that were not yet feasible, the proposed infrastructures seemed to dismiss or exacerbate the race and class divides that characterize the United Arab Emirates. In the imagined future of high technology, Abu Dhabi remained a liberal space for Western white businessmen, and a space of invasiveness for South Asian workers. During an interview, the PRT consultants for Masdar City explained to me that the Abu Dhabi authorities enjoyed the pod cars specifically because they took the driver out of the picture. In some ways, they celebrated the PRT because it would exclude low-wage immigrants from access to the city even as workers. Criticism regarding the segregated nature of the Masdar project became public when the architecture critic of the New York Times called the imagined city “a self-sufficient society, lifted on a pedestal and outside the reach of most of the world’s citizens” (Ouroussoff 2010). 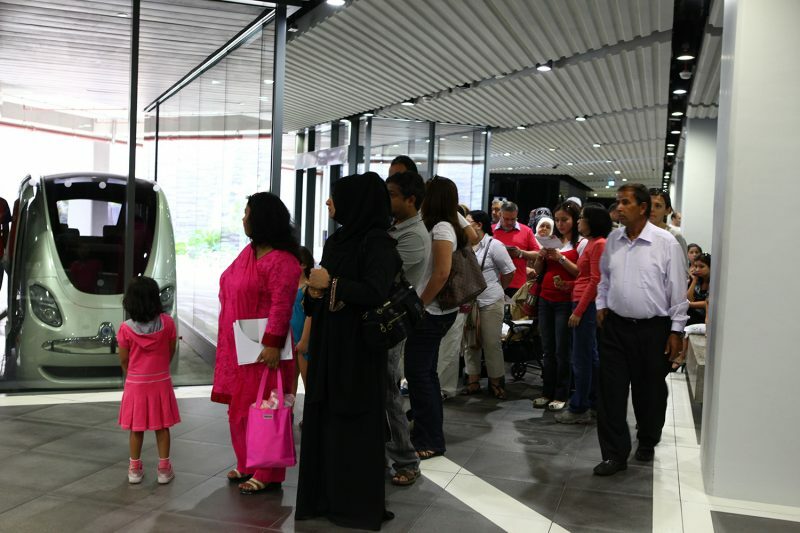 Visitors to Market @ Masdar waited to ride the pod cars. 2011. In response to such comments, Masdar City executives planned the Market @ Masdar, an open house where the residents of Abu Dhabi were invited to experience the eco-city. Though this group did not include workers, thousands of people paid a visit. After leaving their cars at the parking lot, visitors refused to take the readily available shuttle buses, instead insisting on riding the pod cars. They lined up for 20 to 30 minutes, as if waiting for a roller coaster ride in an amusement park. Sylvia, who was the operations manager for the PRT subcontractor 2getthere, perceived these long lines as a clear victory. Her previous work experience with the London Underground and Dubai World was critical for this position: she seemed to understand large transport infrastructures, and knew about professional life in the United Arab Emirates. Also, in a way, she “loved” the pod cars, and advocated their uses for Masdar City. “About 4,000 people took the PRT that day,” she reported when we chatted about the open house. “There were huge lines, and I was telling people standing in line that there is a bus they can take, but they refused to take the bus; they’d rather stand here and wait, they said they came here to take the PRT.” According to her team, the crowds did not indicate a flaw, but rather demonstrated how much everyone appreciated the pod cars, and proved how valuable they were for the eco-city. “Some people understand that as a failure because there were long lines. The system is not designed for such heavy demand, you must understand; our target is the residents at the Institute, which is very small…. But others may have misunderstood,” she clarified. Sylvia was right: for others like Brad, who knew the eco-city, the long lines proved the PRT was not an appropriate way of organizing a city’s transport system. Brad was an Irish man in his early forties, and had been trained as an architect in the United Kingdom. Since 2009, he had been working for Masdar City, mostly managing the relations between Masdar and Foster + Partners. Like Sylvia, he had experience of working in the Arab world: his previous employer was the Energy City of Qatar, and he had also managed a campus development project in Libya. After the open house, Brad remarked, “On Market @ Masdar City, we witnessed the failure of the PRT. It is just not very practical. It does not work for a city. We saw that you cannot just pay, and buy efficiency like that.” Regardless of how much the crowds enjoyed taking the PRT, the system had been incapable of transporting these crowds from one point to another. It had been unable to perform the most essential function of a transport system: to transport people. In this context, the idea of “enjoying the PRT” (perhaps as opposed to “using the PRT”) was significant to understanding the way that both Sylvia and Brad narrated the PRT project. The observation that the visitors to the Market @ Masdar refused any other means of transport, and preferred to line up for the pod cars, implied that they did not understand the PRT as a means of transport per se, but rather as an expensive toy. It was accurate that the system could not cope with such unprecedented demand, but still Sylvia considered the PRT a successful experiment because newcomers to the site enjoyed it as a spectacular experience. Like Elif and Salim, Sylvia also emphasized the multiple material fragments that made up the PRT infrastructure of Masdar City. First, the PRT’s magnetic track needed to be smoother. 2getthere representatives had requested asphalt flooring to ensure this condition, but authorities at Masdar wished to use concrete from the recycled concrete plants on site. Second, the supervisory system was very sensitive. “If a bird enters this space,” Sylvia explained, “then the PRT stops because it thinks that it’s going to hit the bird.” For the PRT to function properly, there had to be no birds inside. 2getthere had preempted this issue and asked for high walls to surround the tracks, containing the vehicle inside a sealed tunnel, but this request was not granted. Third, Sylvia walked me to the PRT doors to show that the runners below were full of sand, and argued that the spaces where two systems contacted with each other were the most difficult to manage. Despite the friction, the pod cars were on track: with the goal of transporting or entertaining passengers. The experimental infrastructure produced a sense of flaw as well as a sense of awe at every step. “Anyhow, when they stop building it, and finally give up on the clean technology cluster, Masdar City will probably transform into an amusement park, don’t you think?” Salim said. He was referring to spaces like the EPCOT Theme Park that were originally conceived as futuristic communities, but later abandoned to become objects of amusement. According to him, in a few decades people would come to visit the ruins of an eco-city—or what was meant to be an eco-city—that would signify not only decay but also traces of an idea, once pursued ambitiously. In this imagined future, Masdar would become more of a spectacle, and its ruin would once again offer entertainment to its spectators in addition to nostalgia for a past where the option of a renewable energy and clean technology future was still available. Yet the entertainment provided in this case would be slightly different from a ride on the pod cars: the automated transit infrastructure promotes innovations for a renewable energy economy, whereas the ruins would denote a possible surrendering of that ideal in a future where this perception was a mere relic. All in all, the half-finished PRT infrastructure effectively situated automated transit in the interstices between hopefulness and anxiety. 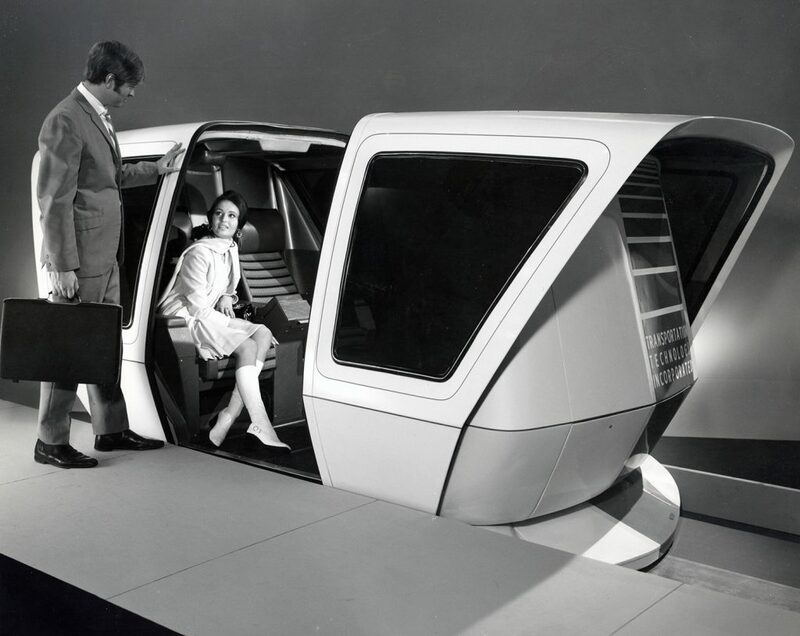 On the one hand, the pod cars helped their users escape to a science fiction future; on the other hand, they kept the fantasy impossible and inaccessible. As they moved back and forth on magnetic tracks, stopped to charge in their docks, and were photographed by the visitors to the site, the PRT pods took on various meanings. In the years following its launch, students, researchers, and professionals at Masdar City tried to determine whether the PRT would remain relevant, especially in the face of other emergent mobility projects such as electric or driverless cars, and asked why innovation in mobility did not focus on more collective solutions. For this article I draw on ethnographic research that I conducted in 2010 and 2011. The prospects of Masdar City have changed since then, and major news outlets that were once enthused about the project have started calling it a ghost town. See, for instance, Goldenberg (2016). For a more extensive analysis of renewable energy and clean technology in Abu Dhabi, please see Günel (In press). Alternate Power. 2009. “Zagato’s PRT Pod A Huge Hit at WFES.” Alternate Power [website]. Available at link. Goldenberg, Suzanne. 2016. “Masdar’s Zero-Carbon Dream Could Become World’s First Green Ghost Town.” The Guardian, February 16. Available at link. Günel, Gökçe. In press. Spaceship in the Desert: Energy, Climate Change and Urban Design in Abu Dhabi. Durham, NC: Duke University Press. Mohsen, Mostafavi, and Gareth Doherty, eds. 2010. Ecological Urbanism. Zürich, Switzerland: Lars Müller Publishers. Ouroussoff, Nicolai. 2010 “In Arabian Desert, a Sustainable City Rises” New York Times, September 25. Available at link.